No job is too large, no job is too small! We work on projects of all sizes. We'll measure for you and give you the best options. MidAmerica fabricates and Installs granite, quartz, marble, and other natural stone surfaces for kitchens, vanities, and other surfaces. 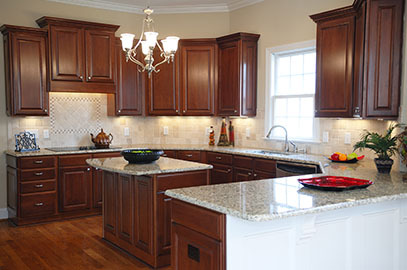 MidAmerica Granite proudly offers cabinets by JSI Cabinetry. 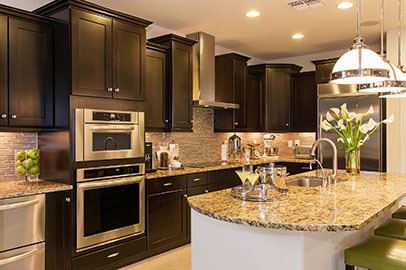 Our cabinets can easily cost you about half the price of the cabinets offered at the big box stores. Custom cabinets and countertop installed. They were great people to work with. Gave me exactly what I wanted! Custom countertop installed to freshen up a kitchen. This is an easy way to increase the value and attractiveness of your home. Give yourself the kitchen you want & deserve. We'll come out and measure for you. We can bring samples and provide our opinions and expertise. We'll provide a detailed quote quickly. If accepted, we will schedule a date to do the install. 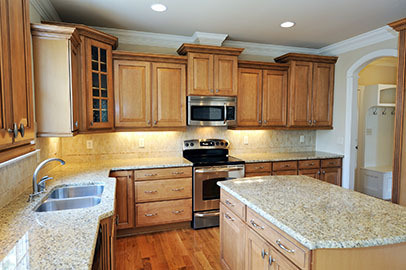 We can remove your old countertops and cabinets. Plumbing services are available as well.